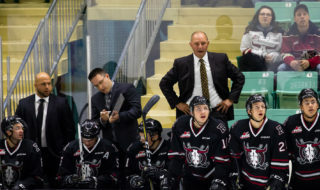 Josh Tarzwell has a solid theory regarding the Red Deer Rebels’ turn-around after a slow start to the current Western Hockey League season. The team opened with a pair of losses to the Edmonton Oil Kings but will head into Saturday’s contest with the visiting Prince Albert Raiders on a four-game win streak. The Red Deer native has clearly accepted his assignment, which has him playing top-six minutes while employing an aggressive, somewhat angry and always physical style. “Brent (GM/head coach Sutter) makes it clear to me what game I have to play in order to succeed and have the team succeed, so I’m just trying to listen to him the best I can and use everything he’s given me,” said Tarzwell. Tarzwell is playing with captain Reese Johnson and Zak Smith on the team’s second line, an indication that Sutter is confident the 18-year-old can contribute offensively this season. Tarzwell has scored once and added two assists in six outings this fall. While his numbers aren’t awesome, he’s confident the points will come. Alex Morozoff has also skated on the second unit and Tarzwell made it clear he’s comfortable playing with either Morozoff or Smith on the other flank. “I like playing with both of them. They’re both great players,” he said. As for his most recent off-season schedule, Tarzwell insisted there was nothing special involved in his training routine. “I just lost weight, that was the biggest thing” said the six-foot-one, 205-pound former Lethbridge Hurricanes forward who was acquired in a trade last December. Notable: The Rebels have reassigned RW Justin Svenson to the Swan Valley Stampeders of the Manitoba Junior League . . . The 17-year-old, a third-round pick in the 2016 WHL bantam draft, was held pointless in 18 games with the Rebels last season and did not dress for a single game this fall. 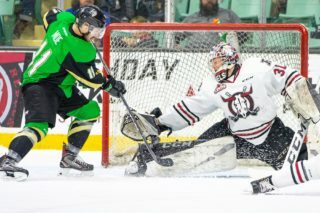 Prince Albert owned a perfect 6-0-0-0 record heading into a Friday clash with the host Lethbridge Hurricanes, and sat first in both the Eastern Conference and East Division . . . RW Brett Leason, prior to Friday’s game, was sixth in WHL scoring with 10 points (3g,7a), three fewer than league leader Brandon Hagel of the Rebels. LW Cole Fonstad had eight points (3-5), while D Sergei Sapego (2-5) and C Sean Montgomery (1-6) each had seven and D Max Martin (3-3-6) and C Parker Kelly (4-1-5 in five games) were operating at a point-per-game rate . . . G Ian Scott, prior to Friday’s game, had allowed just eight goals in five outings, good for a 1.60 goals-against average. The fourth-round pick of the Toronto Maple Leafs in the 2017 NHL entry draft also owned a sparkling .944 save percentage . 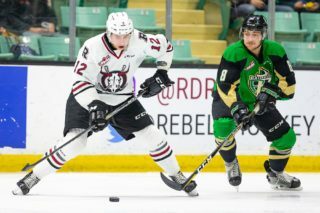 . . C Noah Gregor just recently joined the Raiders after being acquired from the Victoria Royals in July and starting the season in the AHL with the San Jose Barracudas. 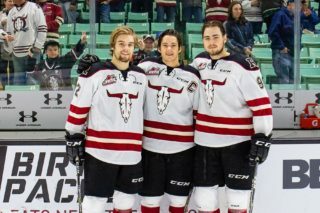 Gregor, who picked up two assists in his only game with the Raiders prior to Friday, was drafted by the San Jose Sharks in 2016, a fourth-round pick. 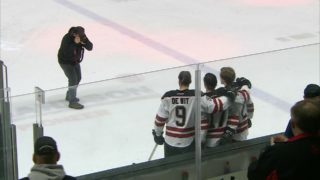 Fonstad was selected by the Montreal Canadiens in the fifth round of this year’s NHL draft and Kelly signed with the Ottawa Senators last year. Injuries: Prince Albert — RW Jakob Brook (upper body, week-to-week). Red Deer — D Carson Sass (upper body, day-to-day). Special teams: Prince Albert — Power play 30 per cent, sixth overall; penalty kill 96.4 per cent, first. Red Deer — Power play 30.8 per cent, fifth overall; penalty kill 82.1 per cent, seventh.